Our day for delivery was scheduled for Friday, October 12 at 9:30 AM; however, the quints decided they wanted to come early! Their decision was fine by me because the night before we delivered I had gone through more pain and discomfort than I could handle. On the night of October 6th I felt like I was continually contracting however with so many babies in my belly it was hard to know if they were actual contractions or just the babies moving. When morning came on the 7th I told my nurse (Deb) how rough the night before had been. She immediately got a hold of the doctor on call (Dr. Saleh). He made it to the hospital rather quickly and in a matter of an hour decided it was time to deliver. I was having frequent contractions and had dilated about 2 cm. If you remember way back to the beginning of our adventure Jacob and I decided to come to Fairview because we heard Dr. Shah was the best around when it came to high risk pregnancies. We felt so comfortable and very confident that we were in good hands. His nature was always calming and his attitude was always positive! So, when we learned that he was out of town and would not make it in time for the delivery we were very disappointed. However, I quickly learned that it would be Dr. Saleh who would deliver the quints and felt an instant sigh of relief. The few times he stopped in my room to check on me during bed rest he always showed compassion and just like Dr. Shah he calmed my nerves and worries. We had to wait about 2 hours from the time the decision was made until the time of delivery. I had eaten during the night so we had to let the food digest before i was able to get the anesthesia and we were also waiting for all of the doctors and nurses to make it to the hospital. I was completely floored by how quickly we had heard that all the necessary people from all teams were at the hospital and ready to start delivery! It was obvious that many people had put a great deal of time into planning for this day. Each team for each baby had their members labeled for what baby they were working for. I even overheard several of them talking that one door was an entrance door to the opposite delivery room and the other door was the exit...now that's attention to detail!! There wasn't a single person in either delivery room who wasn't clear on the procedures and expectations. I wish I could just remember everyone who was there and thank them personally. They truly do deserve recognition for a job well done!! Once Dr. Saleh confirmed that we would be delivering I called Jacob, Lexi, and Amy and told them to get the hospital as soon as possible and I'm pretty sure they all thought I was joking. Each of them responded with "Seriously?" In order to pass time and try to calm my nerves I called and texted so many people asking for their thoughts and prayers for a safe and healthy delivery. I was so nervous that everyone kept asking me if I was cold because I was trembling and shivering so hard. Lexi decided to go to her soccer game in the afternoon and come visit the babies after they were born. Jacob, Amy, and even Jacob's parents made it to the hospital in record time. Since my parents live so far away it obviously took them longer to get here but arrived just in time to get to go see the babies once they were cleared for visitors. After waiting for what felt like forever, I was taken to Labor and Delivery. Jacob and Amy, along with his parents waited in the waiting room while I received my spinal tap. Even this was something that I was extremely nervous about but again, the staff at Fairview did such an amazing job at calming my nerves. After that procedure was complete Amy and Jacob both came back to the two designated operating rooms. One room would not have been big enough to hold all of the teams needed for all 5 babies. I think the total count of doctors and nurses was somewhere near 30. As soon as Jacob was by my side I was able to block everything else out and just be reminded about how much we couldn't wait to become parents together. He did a great job and helping me stay calm throughout the entire procedure. Two rooms and 6 teams of doctors! Brookynn being taken to the other delivery room. 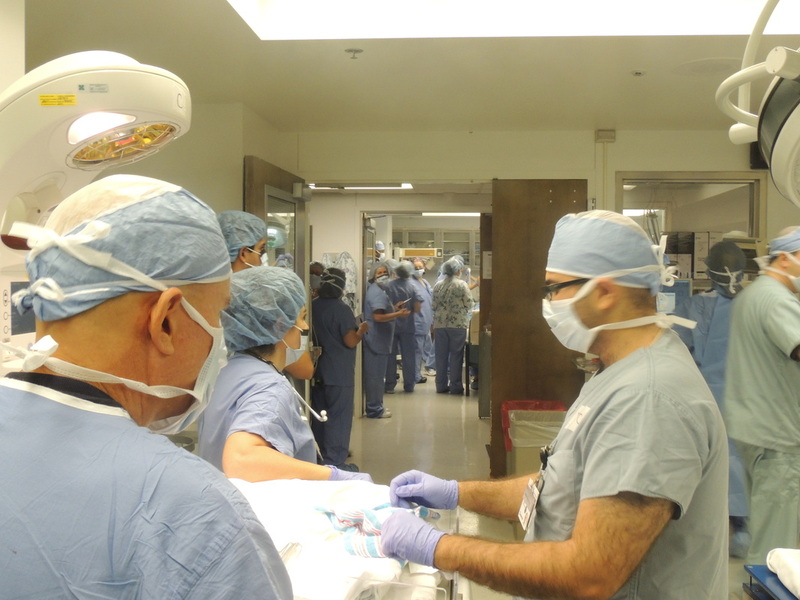 The first three babies to be born (Giovanni, Brooklynn, and Jade) were immediately taken to the second operating room where they were cleaned and assessed. Amy was in this room and able to take pictures just seconds after they were born. The last two babies (Kensley and Leighton) remained in the same room that Jacob and I were in. I was able to see these two right away but had to wait a few hours before I got to see the first three. Even though I didn't see them right away it was a relief to hear them cry while they were being taken to the second operating room. The moment I heard the first little weak cry I was able to relax and knew things had to be going fairly smoothly for them to be crying right at birth. Jacob getting his first look at his new top priority! While the doctors were finishing closing me up the babies were all being taken to NICU. I was then taken to recovery where Jacob, Amy, Lexi. Jacob's parents and my parents met me and waited to be given the word that we were able to go see the quints. To help pass time we watched the Browns game...we all knew what was on everyone's mind but tried to keep our worries at bay. The next few hours brought nothing but good news!! The babies were all breathing well with minimal respiratory assistance. All of their tests and blood work came back normal as well. The good news made me feel like the seven weeks I had spent in the hospital were finally worth it! After a few hours of waiting, we finally got to go meet our little miracles. The second Giovanni wrapped his fingers around mine I couldn't help but cry. He was absolutely beautiful! We made our rounds to each baby and I couldn't help but feel it was all surreal. We had not only been blessed with such a multitude of blessings but also with news of good health and positive outlook for the future.